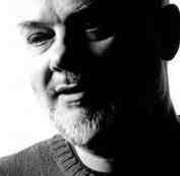 The English DJ John Peel died of a heart attack Oct 25 while holidaying in Peru. Millions of music fans have heard of Peel either directly through his radio show on the World Service or on any number of John Peel sessions whether sold legally or taped off air from a radio. But 30 odd years ago, Peel himself had to sit through a wake - the death of his first radio show, The Perfumed Garden. This nightly show was broadcast at the ungodly hour of two in the morning and played all the new and happening music from the Summer of Love that the BBC refused to play. Naturally, it picked up a huge following among youngsters hip to music. The show was made possible by music PIRATES who broadcast on ships anchored just outside British Territorial jurisdiction. This particular station that Peel worked for was RADIO LONDON. 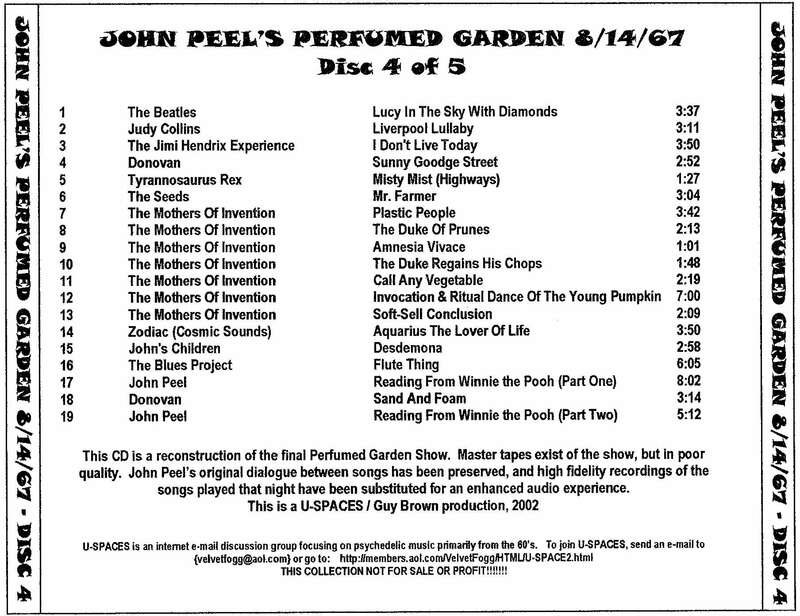 Right now, we have playing a five-disc set called John Peel's Perfumed Garden which contains the final five and a half hours of RADIO LONDON. On this night, Aug 14, 1967, just hours before the British Parliament would pass the Marine Offences Act which would empower the Postmaster General to arrest anyone who was involved with broadcasting music from any pirate radio station, John Peel was passing the night away spinning The Mothers Of Invention, The Electric Prunes, Captain Beefheart, The Misunderstood, The Blues Project, John Mayall, Tim Hardin and of course The Beatles' Sgt Peppers, the biggest album of 1967. 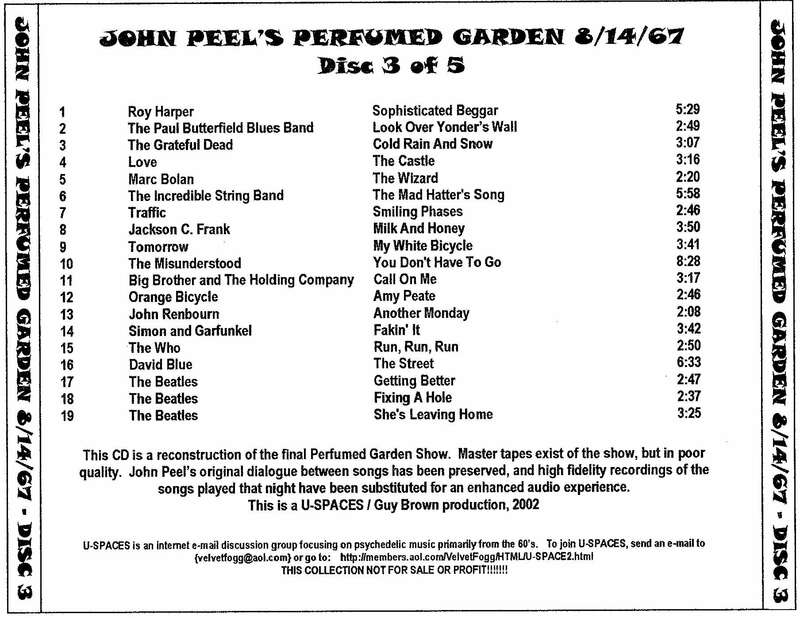 Peel, only five months into his gig as a radio disc jockey, was helming the final show of his Perfumed Garden. The whole show has now been painstakingly put together by a Californian fan of Peel's Guy Brown and his friend Ben Chaput with help from Gary Pfeifer, Craig Gibbs, Paul Moews and David Aspin. Guy Brown was then a teen living in London and he recalled struggling to stay awake to listen to Peel play the final hours of his show. At the time, the BBC hardly ever played the new psychedelic music, weird and wonderful experimental stuff that was being created in 1967. Radio 1 was to begin only on the last day of September. Peel's role and the role of all 13 pirate radio stations was to keep music fans alert to the latest sounds. Brown says, "The music he [Peel] located and introduced to his listeners was truly extraordinary, reflecting the massive upheaval of pop into rock..." Fortunately for music fans, Peel was hired by BBC's Radio 1 and of the DJs they paraded on the first day of broadcast, John Peel was the only to have survived till the present time. This was what he wrote that got him the job. It was a letter to the government broadcaster describing his show, Perfumed Garden, as "a forum for the better sounds in popular music, with the emphasis on the music rather than myself, by better music I mean the West Coast groups and British groups that are trying to do something new and imaginative." 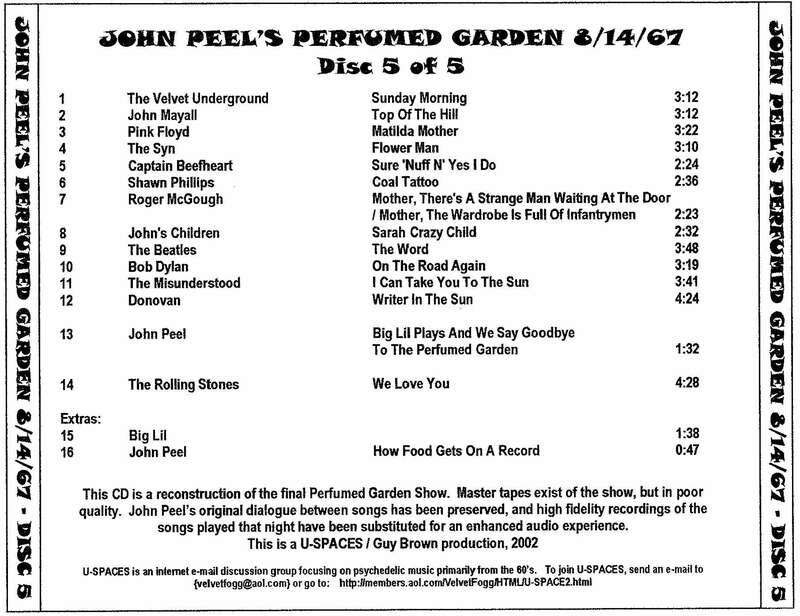 The recordings on John Peel's Perfumed Garden: Final Show Aug 14 1967 came about after Mojo magazine in June 1994 published a full tracklist of the final five and a half hours. 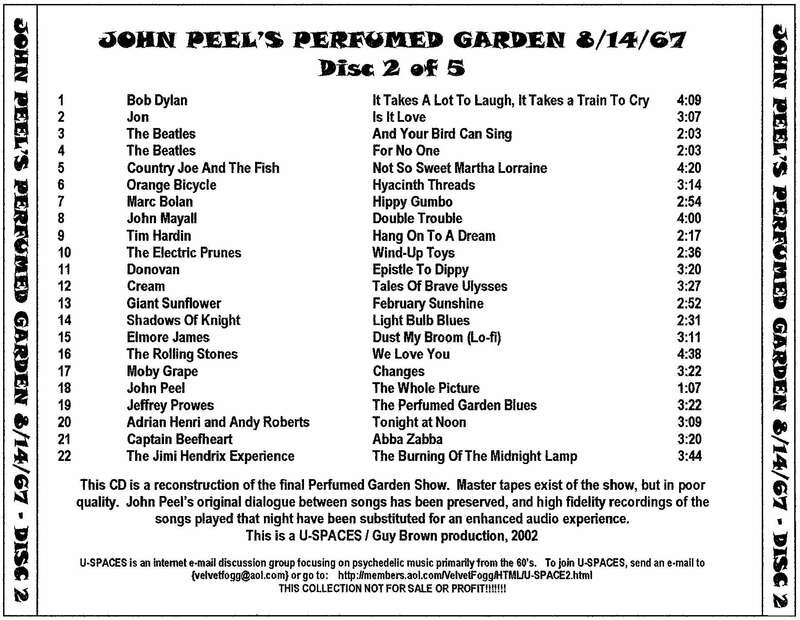 The show has now been reconstructed offering the original John Peel commentary but substituting all the music he played with high-quality versions taken from CDs. 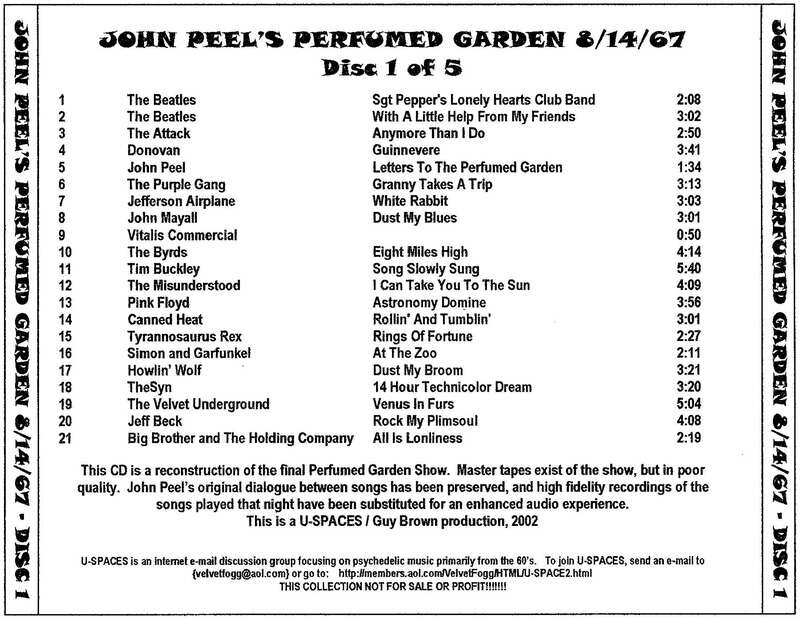 The five disc set was circulated sometime at the end of 2002 through the U-Spaces website. It was given away for FREE.